Melt-in-your-mouth butter crust and thinly sliced apples layered with homemade salted caramel sauce is pie heaven. Recently I have been on a pie-making binge, and every time I make one I tell myself that I need to make more. There’s just something about the smell of homemade pie dough baking in the oven. That wonderful buttery smell that emanates from the kitchen… there’s little that can compete with it. 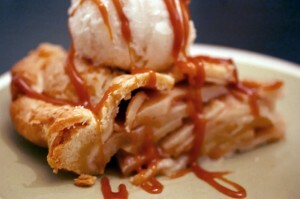 Well, other than that buttery flakey crust piled high with assorted apples and homemade salted caramel. 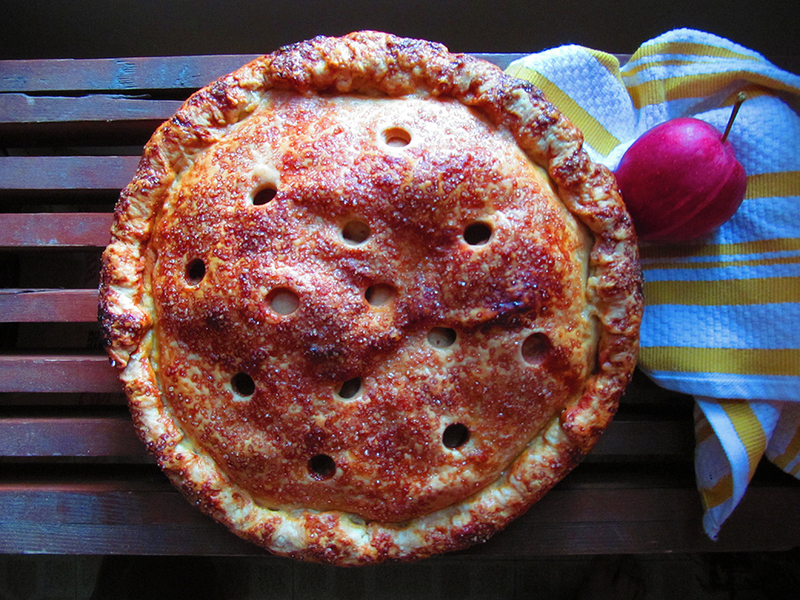 Believe me, this is the pie that will make you a pie addict! Thinly sliced apples are the key to this recipe. I cored and peeled the apples, and then thinly sliced each apple into rings. You can also use a mandoline if you have one. The thin round slices are perfect for piling high and smothering with salted caramel sauce. When deciding on what kind of top crust, I decided to go against the more popular lattice crust for a random cut-circle pattern. If you choose to go with a lattice, make sure it is tightly woven, as thinly sliced apples have a greater chance of drying out. Either way, with whatever type of crust you decide to use, make sure you finish the pie with a nice layer of Turbinado sugar and flaked sea salt (your favorite finishing sugar and plain sea salt can be used). The way the crust browns up with the extra sugar and sea salt just melts into sweet-salty heaven. This is a pie that I can eat all day! Pass the Salted Caramel Vanilla-Bean Ice Cream, please. 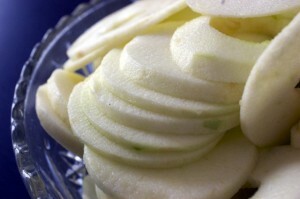 Use a blend of sweet and tart apples... granny smith and golden delicious are a great example. Juice the lemons into a large mixing bowl, removing any seeds. Prepare the apples (peel, core, and thinly slice them with a sharp knife or on a mandoline.) Dredge the apple slices in the lemon juice. Pour the excess lemon juice out and sprinkle the apples lightly with 2 tablespoons granulated sugar. Set aside to soften slightly and release some of the juices, 20 to 30 minutes. In a large bowl mix raw sugar, cinnamon, allspice, nutmeg, black pepper, and flour. Combine the prepared apples to the sugar-spice mixture, leaving behind any excess liquids. Gently turn the apples to evenly distribute the spice mix. Tightly layer the apples in the prepared pie shell so that there are minimal gaps, mounding the apples slightly higher in the center. Pour a generous ½ cup to ¾ cup of caramel sauce evenly over the apples. Assemble the top of the pie crust and crimp the edges. Chill the pie in the refrigerator for 10 to 15 minutes to set the pastry. Meanwhile, position the oven racks in the bottom and center positions, place a rimmed baking sheet on the bottom rack, and preheat the oven to 400°F. Brush the pastry with the egg wash to coat, being careful not to drag the caramel onto the pastry (it will burn), and sprinkle with the desired amount of Turbinado sugar and flake sea salt. Place the pie on the rimmed baking sheet on the lowest rack of the oven. Bake for 20 to 25 minutes, or until the pastry is set and beginning to brown. Lower the oven temperature to 375°F, move the pie and baking sheet to the center oven rack, and continue to back until the pastry is deep golden brown and the juices are bubbling, 30 to 35 minutes longer. The pie will keep refrigerated for 3 days or at room temperature for 2 days. Sweating the apples in sugar and lemon juice before assembling the pie is a necessary step; it releases some of the excess moisture in the fruit and creates a less watery apple pie.